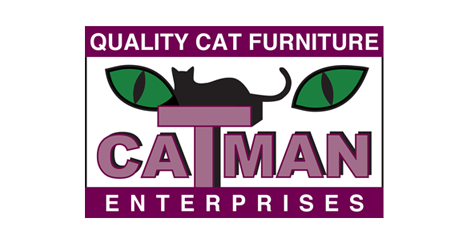 Catman Enterprises has been producing high-quality, hand-built cat furniture in the state of Washington since 1985. 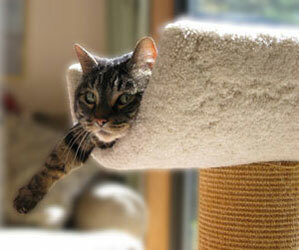 I purchased the business in 2003, and am continuing the tradition of crafting the best-built cat furniture you can buy. My products have a reputation for quality and durability at a reasonable price that make them far superior to mass-produced cat furniture. These truly are "furniture" pieces that will last for many years, thanks to tough-as-nails sisal carpet wrapped posts, top quality carpets, and superb workmanship. Many of the sisal posts I make can be replaced when they do eventually begin to show wear. All my products are made to order and hand-built by me in my Tacoma, WA shop. Scratchers and single posts are available in select local stores and veterinary offices - visit the Links page for locations. I deliver within the local area and have shipped all over the USA (shipping costs vary, depending on size of piece and location). Thanks for visiting, and I hope to speak with you soon!